How the Vajpayee-led government in the late-1990s navigated through the WTO’s TRIPS agreement to craft a one-of-its-kind plant varieties protection law. 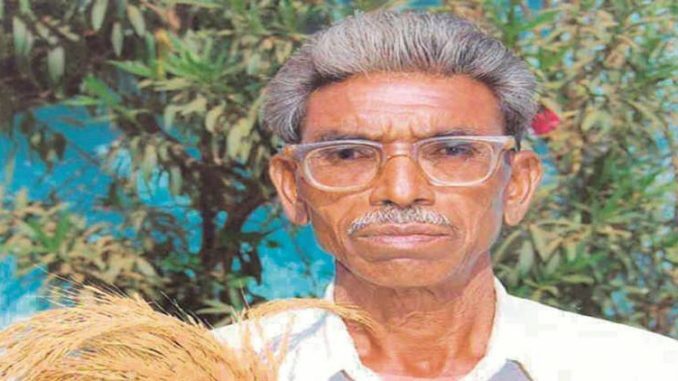 Anjamma from Gangwar village in Medak district of Telangana has collected, stored and maintained the seeds of 70 traditional varieties of rice for over 50 years, recognising their uniquely distinguishable traits. The 70-year-old also takes pride in sharing these with her fellow farmers. Hariman Sharma from Paniala village of Himachal Pradesh’s Bilaspur district has bred an apple variety ‘HRMN 99’. It has unique features of not requiring chilling hours for flowering and fruit setting, maturity in early June after three years of transplanting, and tolerance to scab disease. Sanjeev Kumar from Chakwara village in Bihar’s Vaishali district found some plants of the traditional ‘Hajipur Agath’ cauliflower that produced compact, large curds of good quality. He isolated these plants to develop a new variety, calling it ‘Sanjeev Selection’. Pritam Singh of Urlana Khurd village in Haryana’s Panipat district has identified, purified and multiplied six different variants from Pusa-1121 and Pusa Basmati-6 rice. These variants — from basmati varieties bred by the Indian Agricultural Research Institute in New Delhi — are unique in their agronomy response and adaptation to stresses. He is now looking at getting them accepted by the trade. All these are examples of farmers with practical plant breeding instincts, coming from knowledge of the unique traits present in the varieties being grown by them and ability to pick up “off type” plants in their ecologies. Anjamma, Hariman, Sanjeev and Pritam are only illustrations of the skills possessed by our farmers in evolving new varieties of crop plants, which have also helped in the search for new genes to combat abiotic and biotic stresses and address climate change. Their work in conserving, preserving and selecting plants that can withstand floods, drought, pest and disease is a national treasure. The gene-based crop breeding research by our agricultural scientists blends perfectly with the traditional knowledge and work of these farmers in saving and multiplying seeds of varieties best adapted to their production systems. But development of new plant varieties cannot sustain, unless they are protected in order to ensure their correct usage, even while breeders are encouraged to improve these further. Also, as a signatory to World Trade Organisation in 1994, India was obliged under Article 27(3) (b) of the Agreement on Trade-Related Aspects of Intellectual Property Rights (TRIPS), either to adopt a sui genesis system for plant variety protection or join the Convention of the International Union for the Protection of New Varieties of Plants (UPOV). While India had applied for UPOV membership, the government under the visionary leadership of Shri Atal Bihari Vajpayee, however, realised the restrictions that the Convention would impose on our farmers. His government carefully navigated through the TRIPS provisions and passed the Protection of Plant Varieties and Farmers’ Rights (PPV&FR) Act in 2001. It became the world’s only IPR legislation on plant varieties that recognised and protected the rights of both breeders as well as farmers maintaining traditional landraces. The PPV&FR Authority set up under the Act started functioning from 2005. It received its first application in 2007 and registered the first plant variety in 2009. The Act aims to provide an effective system for IPR protection of plant varieties and the rights of breeders, including farmers. The protection period is for 15 years, and 18 years in the case of trees and vines. Unlike UPOV, the Act facilitates protection of not only new, but even extant (existing) varieties. That includes those notified under the Seeds Act (1966), farmers’ varieties and varieties of common knowledge. While incentivising plant breeding activity and encouraging the development of the seed industry through varietal improvement, it also seeks to reward farmers for their contribution in the conserving and improving of genetic resources. The PPV&FR Act differs from UPOV (1991 Convention) also in that it entitles farmers to save, use, sow, re-sow, exchange, share or sell their produce (including seed) from a protected variety. This is as long as they do not resort to branding or packaging of the variety for commercial purposes. At the same time, breeders (including farmers as plant breeders) have exclusive rights for the commercial production, sale, marketing, distribution and export of their protected varieties. Further, any plant breeder or researcher can use a registered variety for conducting experiment and research, or as an initial source of genetic material (parent) for the purpose of developing another variety. This is so long as the protected variety isn’t used as parent repeatedly for the production of commercial seed, which requires the prior authorisation of the original breeder/farmer. The latter, moreover, concerns hybrid varieties, which entail repeated use of a parent for the production of seed. The PPV&FR Act also provides for facilitating and regulating the claims of benefits accruing from a protected variety. Such benefits are to be shared with plant breeders or even farmers/farming communities. The latter is subject to sufficient evidence being made available on the involvement of the plant species maintained or improved by them (though not necessarily protected) in the development of the new variety registered. The PPV&FR Authority follows internationally recognised principles of Distinctiveness, Uniformity and Stability or DUS, while granting registration to any new plant variety belonging to 156 notified crop species. The variety, at the time of application, should have been in trade for less than 12 months in India, and less than 48 months if abroad (in the case of trees and vines, the duration is 72 months). During the last 11 years, the Authority has received 15,455 applications of crop varieties, out of which 10,900 (70 per cent) are from farmers alone. So far, a total of 3,437 varieties have been granted protection, of which 1,531 belong to farmers. The Authority facilitates the development and commercialisation of new varieties through formal linkages with agricultural universities, research institutions and Krishi Vigyan Kendras. The Authority’s focus has been on implementation of benefit sharing from protected varieties with farmers, whether as conservers of diversity or as breeders in their own right. This mainstreaming approach, enabled by a one-of-its-kind IP protection law, essentially converts progressive and skilled farmers into professional businessmen, even while providing new varietal choices to fellow farmers.